This tastefully decorated, four bedroom apartment is located in the dress circle of Woburn and is accommodation with a difference. 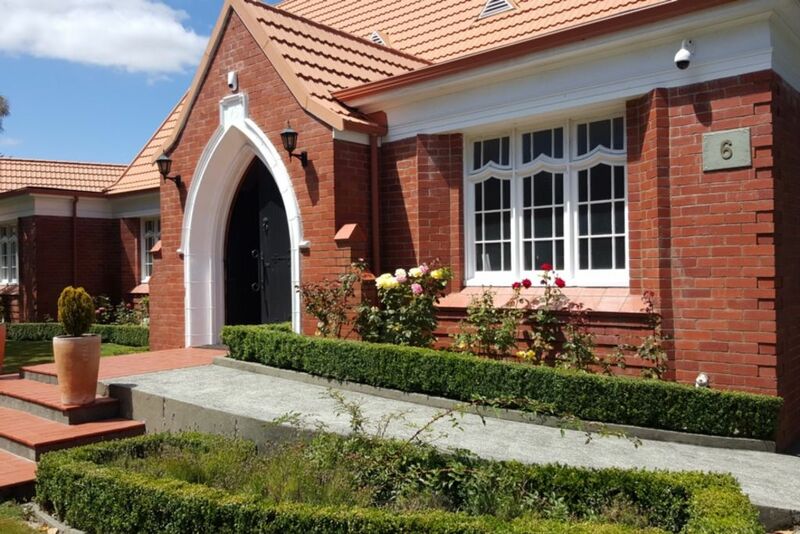 It is part of a "Grand Designs" scale church conversion which is now an executive residential property and is one of the most unique homes in Wellington. The property is in the Dress circle of one of Lower Hutts most exclusive suburbs. Located across from park, information book with popular places to visit available onsite. This apartment is fully self contained with independent private access. The owners are generally happy to show you around and share this unique property with you as time permits. Five minute walk to the train station, 15 minute train ride to central Wellington, local bus and taxi services also available. We were a group of four women on a golfing trip. The Holy Grail, was clean and well appointed. The bedrooms were large and the beds very comfortable with nice linen. The kitchen has everything you need. Our only slight negative is the size of the living area, there is no dining table and lounge is very small. There are no curtains in the bedrooms, the windows are high so there is no issue with privacy it is more the matter of the light streaming in and some of our team found that it disturbed their sleep. If you are just using this as a base for lots out of home activities this is a great option. The shower was very good, great pressure. Misleading outside photos, you do not stay in the main body of the old church, you stay in an annex out the back. There is no Dining room, no table to eat off. The bathroom is pokey to say the least, you can not use the toilet as a man for number 2's as the canted ceiling is too low. The Bedrooms need curtains to make them dark. Your feedback is surprising given this was your teams 2nd stay. If the apartment is bad as you make out surely you would not have re-booked. We went out of our way to make your staff have a great stay. Their direct feedback was positive. We offered them use of a second bathroom and allowed you to store your Ute and trailer for almost 2 weeks at no cost. The photos accurately show each room and the apartment is not an annex out the back but is the upstairs of the main property. We had business at Hutt Hospital, so the location was great. This was a lovely apartment in a great location for visiting Wellington. This was a lovely apartment in a great location for visiting Wellington. Great host and provided all the amenities you’d need for a comfortable stay. We were 7 adults staying in this large, 4-bedroom property. We were 7 adults staying in this large, 4-bedroom property. The bedrooms were spacious and the beds quite comfortable. The bathroom was very modern with a GREAT shower. Loved the wood floors throughout. We had a really comfortable stay. Would definitely stay again.